Press release: (Nairobi, Kenya) May 4, 2017 – As five countries in Africa, including Kenya, gear up for general elections later this year, a new report published today by the International Development Law Organization (IDLO) highlights the need for a strong judicial electoral dispute resolution mechanism. “As a contest for political power, elections by their nature invite disputes. Effective electoral dispute resolution is therefore key to preventing electoral violence and ensuring legitimacy of the results,” said Ms. Irene Khan, IDLO Director-General. In an environment marked by ethnic tensions and low public trust in political institutions, the successful management of election petitions by the judiciary was a key factor behind the relatively peaceful elections and transfer of power in Kenya in 2013. 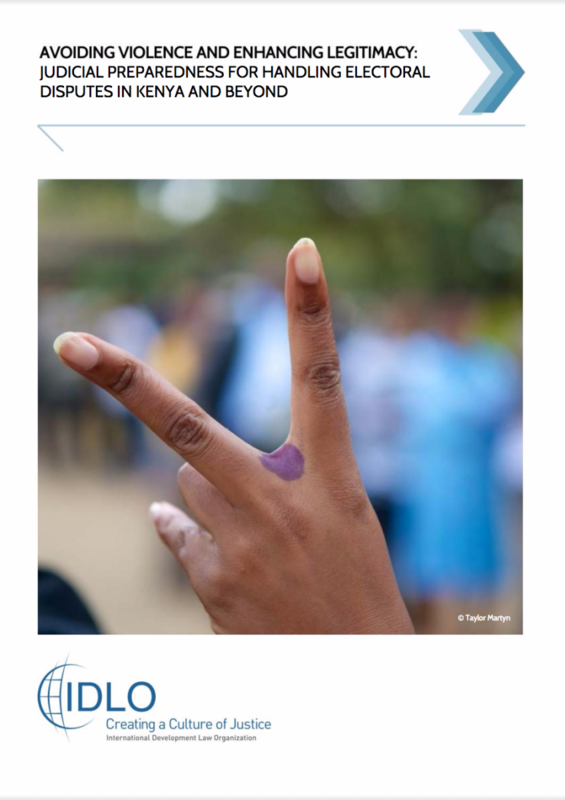 The report, Avoiding Violence and Enhancing Legitimacy: Judicial Preparedness for Handling Electoral Disputes in Kenya and Beyond, draws lessons from IDLO’s work supporting the judiciary in Kenya. “IDLO’s report highlights practical lessons from Kenya and other countries of how electoral grievances can be resolved through judicial means, ultimately improving public confidence in democratic elections, reducing the risk of conflict and sustaining peace,” said Irene Khan. In many emerging democracies, concerns about judicial independence deters candidates from using the courts to adjudicate electoral disputes. 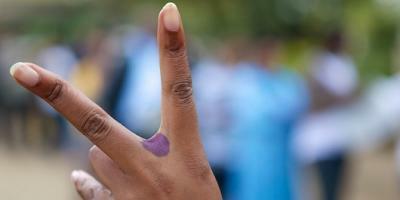 Weak and incoherent laws and opaque systems prevent the timely and fair handling of electoral complaints. Courts do not have the capacity, knowledge or means to effectively manage electoral disputes. Electoral cases cannot be treated in the same way as other matters that come before the judiciary because of the inherent political sensitivity, the high public interest in their outcomes, the intense bursts in which election petitions are filed, and the short time limits in which election matters must be dispensed. Public outreach to empower marginalized groups, political parties, candidates and lawyers to use the electoral dispute system. “An electoral dispute resolution system has little value if it remains inaccessible or unknown to the public,” added Irene Khan. IDLO’s report calls for public outreach activities to reassure the electorate that the judiciary is prepared and able to manage electoral disputes fairly and transparently and, after the elections, share progress, promote transparency and counter any false perceptions of bias. “At the end of the day, the most critical challenges are not always related to the law and the judiciary itself but derive from the attitudes and behavior of political and other actors and institutions. Alongside electoral dispute mechanisms of the judiciary, parallel measures must be taken to strengthen the electoral administration and electoral management bodies,” said Ms. Khan. Read and download the report at http://www.idlo.int/publications/avoiding-violence-and-enhancing-legitimacy-judicial-preparedness-handling-electoral. Judit Arenas, Director – External Relations, jarenas@idlo.int, mob +1-646-506-5996. You can also follow the Nairobi report launch on Twitter: @IreneKhan or @IDLO #ElectionsKE and on Facebook IDLOnews. The International Development Law Organization (IDLO) is the only intergovernmental organization exclusively devoted to promoting the rule of law. IDLO works to enable governments and empower people to reform laws and strengthen institutions to promote peace, justice, sustainable development and economic opportunity. Kenya is a Member Party of the organization. IDLO has been active in Kenya since 2010, helping to build the capacity of the justice sector and the legal profession. It supported the design of the 2010 Constitution of Kenya and has been providing technical support to institutions mandated to implement or monitor the constitutional implementation process. More recently, IDLO has supported the government to mainstream gender at the national and country levels, including through legislative reforms to promote gender equality. One of the critical areas of support by IDLO to the judiciary has been to strengthen its capacity for electoral dispute resolution. Between 2012 and 2014, IDLO worked with the Judiciary Working Committee on Election Preparations (JWCEP) to strengthen the judiciary’s capacity to manage the disputes arising out of the 2013 elections. Currently, it’s working with the Judiciary Committee on Elections (JCE) and the Political Parties Disputes Tribunal (PPDT) to ensure the judiciary will be able to better manage disputes that may arise from the 2017 election. In 2016, IDLO and the Judicial Training Institute of Kenya published a book on emerging electoral jurisprudence and electoral dispute resolution mechanisms as prescribed in the 2010 Constitution of Kenya.